Introducing the newest Hatchimals straight from Hatchtopia: the HatchiBabies! These magical creatures are hidden inside colourful speckled eggs, but they have a secret – they’re forever babies! Super sweet and super soft, these adorable new HatchiBabies have even more surprises than EVER hidden inside their eggs and they can’t hatch without you! 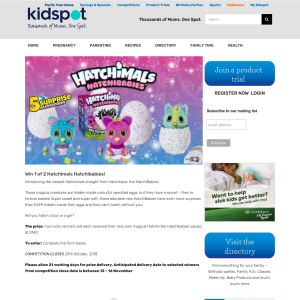 The prize: Two lucky winners will each received their very own magical Hatchimals Hatchibabies valued at $140. To enter: Complete the form below.